KUCHING: Sports tourism will get a major boost next year when Sarawak play host to the World Para Swimming Championships and the Asia Masters Athletics Championships. 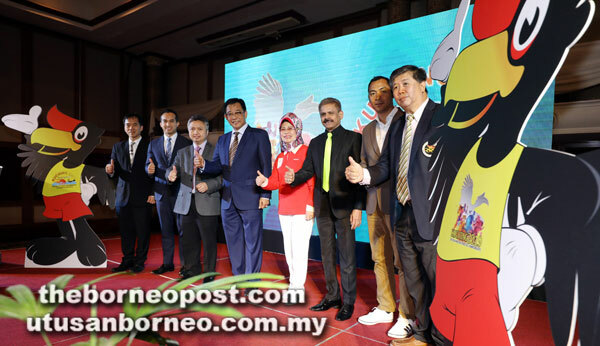 Minister of Tourism, Arts, Culture, Youth and Sports Datuk Karim Rahman Hamzah, who launched the two events at Riverside Majestic Hotel here yesterday, said both championships will coincide with Visit Sarawak Year (VSY) 2019. He added that Kuching will make history as the first city in Asia to host the World Para Swimming Championships from July 29 to Aug 4. The event, which will be held at the Pandelela Rinong Aquatic Centre, is expected to attract 800 athletes and 400 officials from 80 countries. It will also boost Malaysia’s image in the promotion of inclusiveness and equality. Another 3,500 entries from 30 countries are expected for the 21st Asia Masters Athletics Championship to be held at Sarawak Stadium, Kuching from Dec 2 to 6, 2019. “We will be able to witness many former national and international athletes who are still at the top of their game in this remarkable event,” said Karim who is also Asajaya assemblyman. The minister revealed that the early launch of both events was to enable the state government to put everything in place for the big day, especially the needs of the para athletes. Accessibility of para athletes at hotels and venues will be given extra focus as well as the need to charter special buses equipped with ramps. Also present at yesterday’s ceremony were Minister of Welfare, Community, Well Being, Women, Family and Childhood Development Dato Sri Fatimah Abdullah, Assistant Minister of Youth and Sports Datuk Snowdan Lawan, Paralympic Council of Malaysia president SM Nasarudin SM Nasimuddin, Malaysian Masters Athletic Association patron Datuk Seri V. Pulainthiran and the Sarawak Masters Athletic Association president Dato Sri Azman Samaon.